Here’s an exercise that will help you know the fretboard better. Unless you know what the notes are on the fretboard you cannot apply theoretical knowledge, you can’t sight-read, you can’t easily move things around the fretboard, and so on. Knowing the fretboard is KEY. You need to know it and that’s the end of it, OK? Good. This exercise is limited to the 12th fret; we’re not bothering with the dusty end. If you practise this mentally, then picture the guitar neck in your mind as you say the fret locations. Use the dots on the fretboard as a mental visual reference, also. What you want to work on is to reduce any mental lag that happens when you want to find a note. So I use a metronome to measure this thinking time. I suggest setting the metronome to 72 BPM and try to complete the 1st exercise of playing all the Cs by giving each note 4 clicks of the metronome. Use that time to think ahead to where the next C is. With any technical exercise like this I think it best to approach it in a cold, technical way. Think of it as a ‘yes or no’ thing. Can you do this – yes or no? No excuses. No mistakes. Doing this will reinforce the idea that technical exercises are NOT music. Running scales, learning your notes, your arpeggios, chords and all the rest of it are nothing to do with music. Just as a tin of paint or ‘perspective’ is not art. When you can do C, move on around the cycle and do F. 1st string, 2nd, 3rd, etc. Until you’ve gone right around the cycle to arrive back at C.
That’ll be C F Bb Eb Ab Db Gb B E A D G C.
See this post for a simple way to memorise the cycle. When you can do this exercise with 4 clicks per note at 72 BPM the whole thing will take 4 minutes out of your day. Now your aim will be to reduce the thinking time. So do the whole exercise to a rate of three clicks per note. At a rate of one click per note the exercise takes one minute. After that, maybe two notes per click or increase the BPM. Also try doing the exercise not looking at the fretboard. 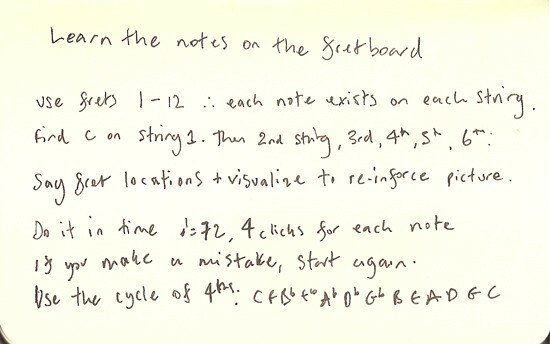 Also try visualising what the note looks like written on a treble clef stave as you play it.